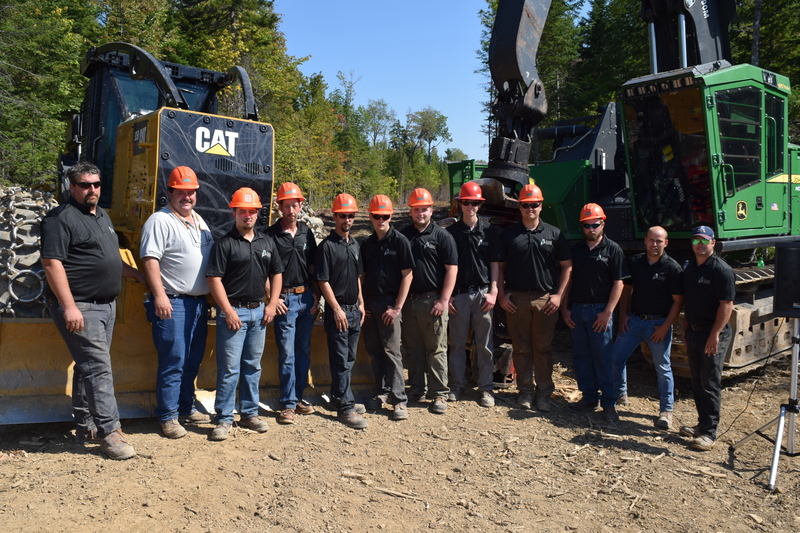 Aroostook County – Maine’s first Mechanized Logging Operations program hosted a Completion Ceremony for its second class of graduates on September 14th, 2018. 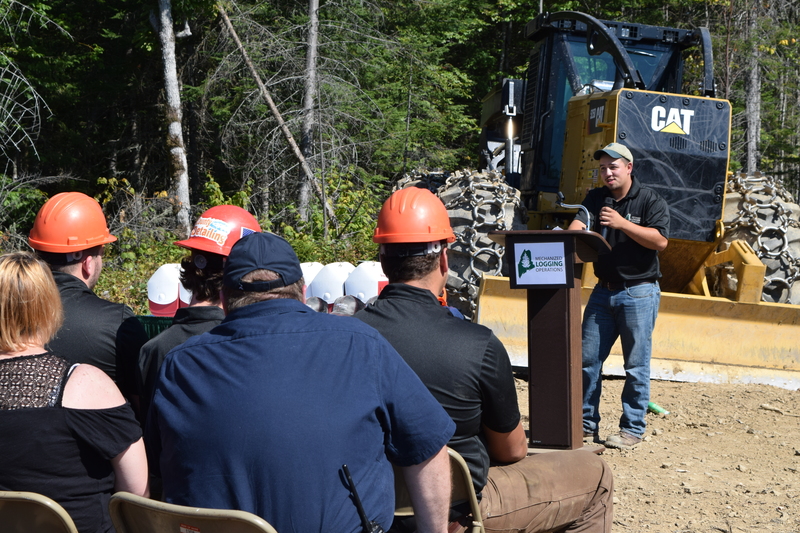 Supporters of the program, families of the trainees, industry leaders, and legislators gathered at the program’s woodlot south of Ashland, Maine for the celebration. The students that completed the rigorous program were Jack Houtz, Parrish Lovely, Ralph Nichols, Deric Buswell, William Shufelt, Evan Burgay, Benjamin Shaw, and Logan Johnson. Another significant factor in the development of the program was the increasingly high cost of training shouldered by private companies. Historically, employers spend approximately $100,000 to train their mechanized operators. Student Ben Shaw of Pittston, Maine said, “I was pretty shocked” to learn that everyone in the group had received job offers before graduation; counting on his fingers, Shaw shared that he’d already received five job offers from different logging companies. In doing the math, Shaw calculated that in the first four years of his logging career, he’d be $200,000 ahead of traditional college students, who typically need significant student loans. Shaw’s favorite piece of logging machinery is the buncher. Donald Burr, the NMCC program coordinator, noted how satisfying it was teaching this group of students. Regarding the donations that made the program possible, Burr said, “Not only did these companies donate to us, but they stood behind us every step of the way.” When he or his students had questions about the machinery or products, he said the companies treated them like they were a “big deal” even though they weren’t spending significant amounts of money. State Representative Chris A. Johansen made his way up to the ceremony from Monticello, Maine, after being impressed by the ceremony last year. “When you accept donations like this, you don’t want to waste time, and they didn’t,” Johansen said. “You can tell the program has high standards; you can tell by looking at the instructors. I will gladly support this program.” When asked why he thought it was the first program of its kind in Maine, Johansen cited the extremely high start-up costs, including the very expensive equipment. Fortunately for these new graduates, and the companies employing them, Milton CAT and Nortrax, Inc. donated millions of dollars worth of state-of-the-art equipment. This cohort of students was selected from a pool of applicants and screened to the highest industry standards, including background checks, drug testing and interviews with current contractors. The funding for the program is from the Maine Quality Centers with monies from both the state of Maine and a 50% match from industry, making this a public/private partnership. 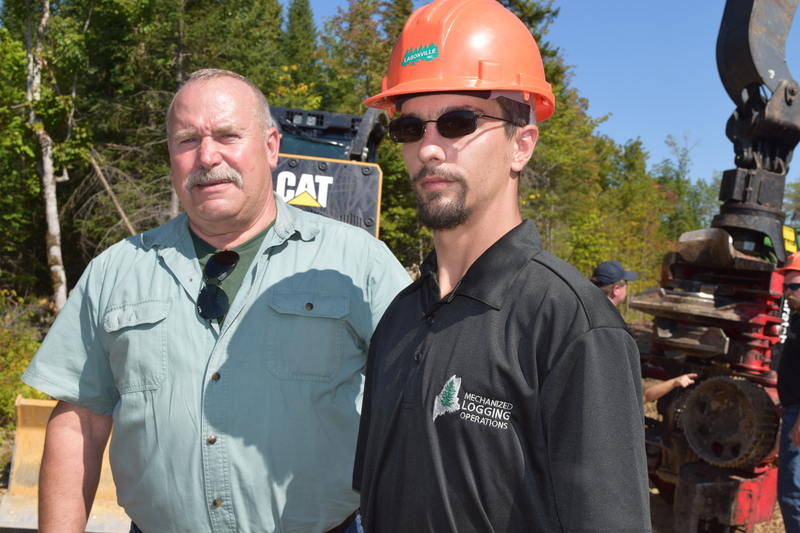 “Both the industry and the Community College System recognize that logging is a vital piece of the Maine economy. They have both stepped up to make this investment to create a well-trained workforce,” stated Leah Buck the Assistant Dean of Continuing Education at Northern Maine Community College. The woodlot for the program was made available by Prentiss & Carlisle and the money earned from the harvest will go back to the program to help offset costs and aid in sustainability for future cohorts. 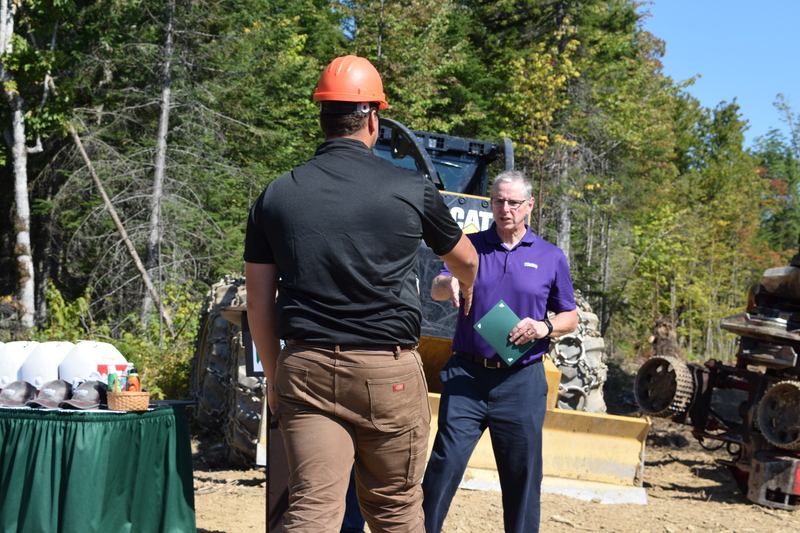 The program was also made possible by donations from other partners including Professional Logging Contractors of Maine, Acadia Insurance, Katahdin Fire Company, Madden Timberlands and Maine Quality Centers. Graduate Ben Shaw accepts his completion certificate from NMCC’s President Timothy Crowley. Graduate Jack Houtz, also a graduate of UM Orono, made an impactful speech expressing his gratitude for the program and its many supporters. Graduate Jack Houtz accepts his completion certificate from NMCC’s President Timothy Crowley. 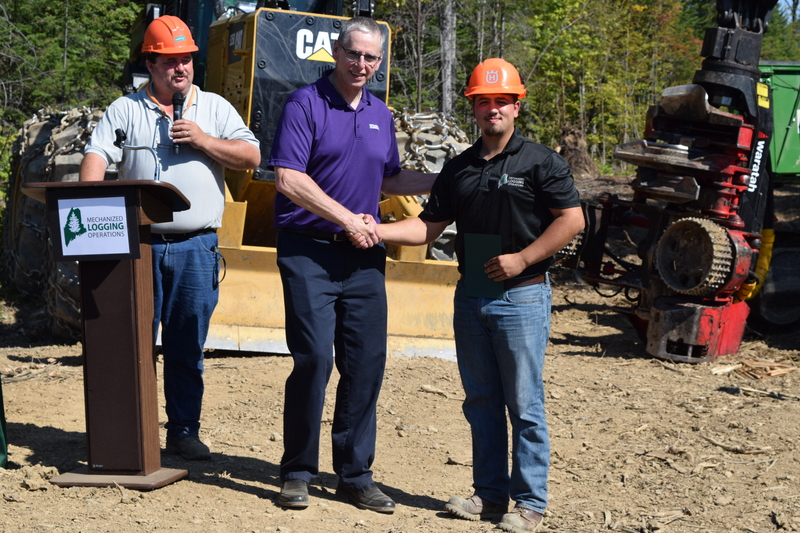 Mechanized Logging graduate Ralph Nichols with State Representative Chris A. Johansen after the ceremony. (Left to right) Mike Berube (field instructor), Donald Burr (program coordinator) Jack Houtz, Parrish Lovely, Ralph Nichols, Deric Buswell, William Shufelt, Evan Burgay, Benjamin Shaw, Logan Johnson, CJ Martin (field instructor), and Brandon Leblanc (field instructor).